The World Health Organisation recently reported two cases of polio in Ukraine and one case in a Guinean child in Mali. All three cases were identified as “vaccine-derived”, a mutant form of the original, “wild” poliovirus. Polio is a highly contagious and devastating disease, which mainly affects young children in areas with poor sanitation. The virus invades the nervous system and can cause permanent, incurable paralysis or death. The recent outbreaks are a setback for a year that has otherwise produced some major achievements in polio reduction. The number of cases caused by wild poliovirus dropped to 39 this year compared to 169 in the same period last year. At the end of July, Nigeria, which along with Pakistan and Afghanistan is one of only three countries that hadn’t eliminated polio, marked 12 months without a single case. In August, the entire African continent announced it had been polio-free for 12 months. Among these great gains in polio reduction, news of three infected children is a significant reminder that no country can be complacent. Every child should be immunised against polio. There have long been warnings that Ukraine’s under-immunised population was vulnerable to a polio outbreak. In June 2013, the medical journal The Lancet highlighted that only 50% of Ukraine’s children were fully immunised against polio, measles, rubella and other diseases - compared with 92% in Australia. Ukraine’s low immunisation rates are partly due to the strong anti-vaccination lobby in the country. 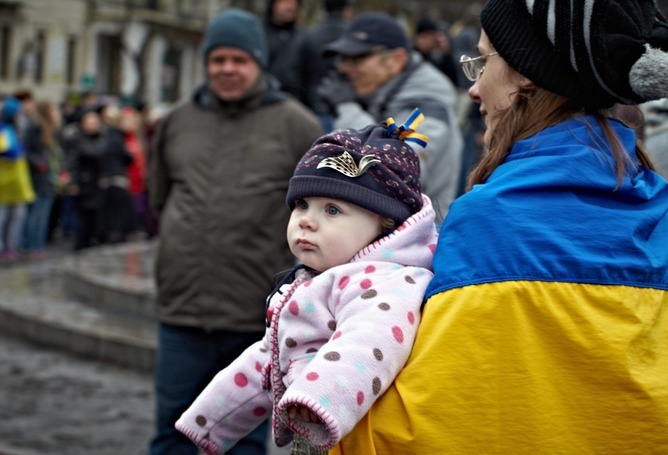 A UNICEF survey found that only 46% of Ukrainian parents had a positive attitude towards immunisation. But immunisation alone can protect children from the virus and prevent potentially permanent paralysis. The most common polio vaccine used in the world is oral polio vaccine, which contains three types of live, weakened viruses. The vaccine induces immunity against all three types of wild poliovirus in the gut of a vaccinated child. This prevents the viruses from entering the bloodstream and the nervous system to cause paralysis – polio’s worst symptom. But, in rare cases, the weakened virus in the oral vaccine can also cause paralysis. This is estimated to happen in one in nearly 3 million children receiving their first dose of oral polio vaccine. For this reason, most higher-income countries, such as Australia, have switched to the injectable, inactivated (or dead) polio vaccine, which induces immunity in the bloodstream and from which there is no risk of paralysis. Only half of Ukraine’s children are fully immunised against polio, measles, rubella and other diseases. When children are given the oral vaccine, they excrete the vaccine-virus for a period of six to eight weeks. As the virus is excreted, it replicates in the environment, and through this replication can be genetically mutated into a stronger form that can cause paralysis. These altered viruses are called circulating vaccine-derived polioviruses (cVDPV). If a population is seriously under-immunised, there are enough susceptible children to keep these viruses circulating via contaminated water and food in the community for a long time. The three types of wild polioviruses are reflected in the three types of vaccine viruses. The strain of cVDPV then, reflects the type of vaccine-virus that has mutated. The two Ukraine children were infected by cVDPV Type 1, which is very rare; the only other country that has reported cases of this type since 2010 is Madagascar. The most common strain of cVDPV is Type 2; there were 55 cases in 2014 but just two so far this year. The last case of cVDPV Type 3 was in Yemen in 2013. Ukraine’s vaccination schedule is “in transition”, which means children are given both the oral and injectable vaccines. The two children who were paralysed by cVDPV were inadequately immunised by either vaccine, so both their gut and bloodstream were infected, followed by their nervous system. Guinea provides only oral vaccines, so the paralysed Guinean child diagnosed in Mali had probably received fewer than the recommended minimum of four doses. So, why don’t we stop using the oral vaccine? First, it stops transmission of the wild poliovirus because it ensures immunity in the gut. Therefore, a fully vaccinated child who is exposed to the wild virus will not excrete it and pass it onto another child. On the other hand, the injectable vaccine prevents paralysis in fully vaccinated children. But it doesn’t prevent the virus from infecting the gut and then being transmitted to other children. This was demonstrated during a “silent” outbreak of wild polio virus in Israel in 2013. The virus was detected in hundreds of sewage samples in a large number of locations. Luckily, the outbreak produced no cases of paralytic polio, because 95% of Israeli children are fully immunised with the injectable vaccine. This is then a great example of how a country can ensure none of its children are paralysed by polio, even if the virus is transmitted to the area. The outbreaks in the Ukraine and Mali are a timely reminder that all countries in the world need to maintain high polio immunisation rates. In an era when people travel with their children to all corners of the world, both the wild virus and the vaccine-virus can readily be imported and can infect and paralyse those children who are not protected, including the 8% of Australian children who are not fully immunised.